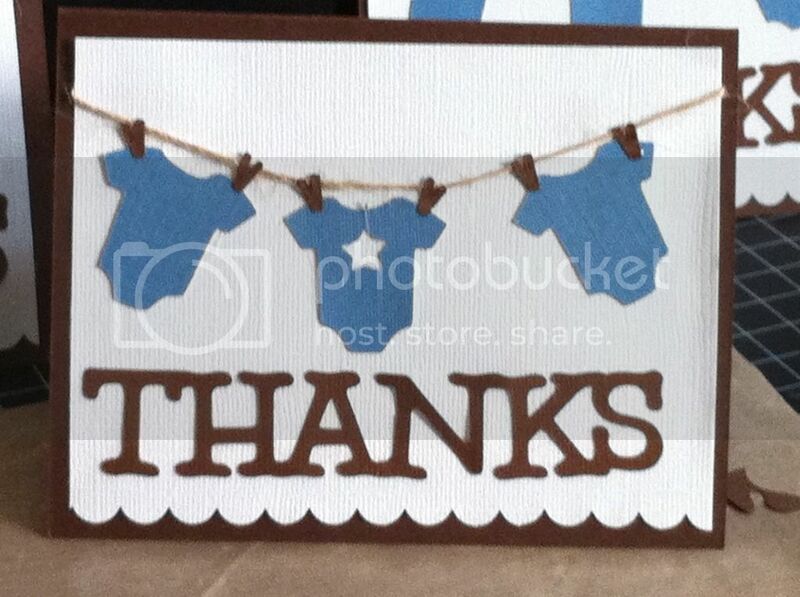 Here's another baby-themed thank you card. There's something about onesies--you can never have enough whether they be actual baby clothes or crafts which feature them. Oh, I also made one for baby's wall, which I'll show as soon as I affix it. Anyway, inspired by the card feature from the Welcome Baby image on Life's a Party, I used the negative cuts to make this card, strung a clothesline out of twine, and cut clothespins from Straight from the Nest. Cardstock is PaperTrey Ink and assorted bits from my stash. The sentiment is cut using the Cricut Alphabet cartridge which came with my E2. The simple scallop edger is from Stampin Up!